Rumours about the disc-free console, apparently codenamed Maverick, began previous year, with the Xbox One S All-Digital name appearing earlier this month. 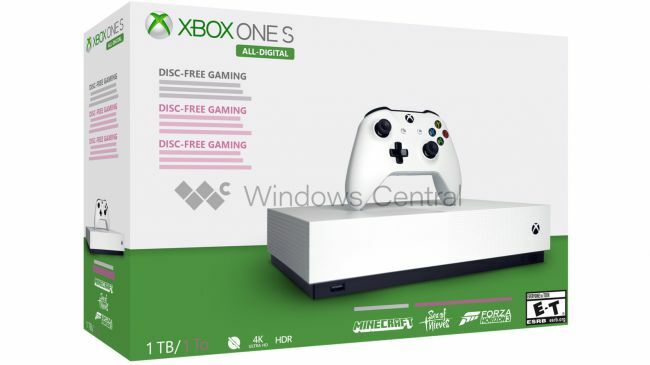 The images apparently show a console that's nearly visually identical to the Xbox One S, minus a disc drive and eject button on the front-left. ID@Xbox is an initiative from Microsoft and the Xbox team that allows developers of various sizes to self-publish their games on the Xbox One or Windows 10 platforms. As such, it seems very unlikely the Xbox One S All-Digital Edition will launch with built-in streaming on May 7, 2019. Previously codenamed "Maverick", this new member to the Xbox One family would completely ditch the use of Blu-Ray discs, signalling a shift to purely digital gaming, at least on Microsoft's side. Windows Central reports on documents that show the launch date will be in early May. Back then, the new console was expected to have a mid-May launch. What will the Xbox One S All-Digital offer? The leaks also show that the new Xbox One will be bundled with three different high-profile games, including Minecraft, Sea of Thieves, and Forza Horizon 3. The landscape of gaming is changing and disc games must be installed and updates downloaded.